Is anyone can explain what is the meaning of "specify point on circle" as in the picture below? That is occurred when I want to draw a circle. Normally in LC 2.1.3, when I draw line, then I point to one coordinate. Then by command line I enter the radius as asked. But now with LibreCAD 2.2.0 RC1, it is very confusing and I don't know what is the logic behind that change? The LC2.1.3 was correct, it is asked the radius. With this LC 2.2.0 RC1, I have to point somewhere, then I edit the properties to enter the right radius. It make the simple thing become complicated. Really not necessary. I hope this is corrected in the LC 2.2.0 final release. If not, this is will be a failed release. Did you use Center,Point? If so you can specify a radius after locating the center point by using a relative coordinate. For example: @6,0. This would result in a circle with a radius of 6 units (mm, inch, foot etc). Another way is to use Center,Radius. With this method you enter the desired radius in the box located at the top of the screen and then specify the center point. What you experience is with the circle "Center, Point" command. 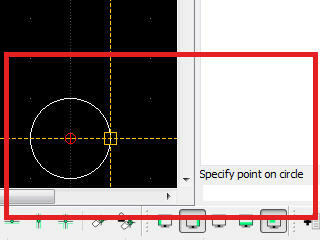 Use "Center, Radius" instead and tell the radius in the tools options bar above the drawing area. There were some emotional discussions about this in past and also different code contributions. For the "Center, Point" tool the earlier text was about to enter radius, what was also confusing, as you need to enter a coordinate to specify the circle radius and not the distance from center. So we finally ended with "Specify point on circle", which at least is the radius, as every point on the circle has the distance of radius from center. When the radius of a circle is known, one better goes with the "Center, Radius" tool, as mentioned above. But you can handle this with the "Center, Point" tool too. After specifying the center, enter the radius as relative coordinate in the command line. If you want a circle with radius 10, you can enter "@10,0" or "@0,10" to specify the point on circle at 0° or 90° direction. But the main intention for the "Center, Point" tool, is when you want to draw a circle which has its constraints in the drawing, where you possibly don't know the center or radius. Let me tell that my intention to post this "complaint" is not because I don't like LibreCAD, but it is because I like it. I love it. This is my way to give feedback for development. I have AutoCAD 2007 installed in my computer so do QCAD. But I want to leave them. Here is my drawing. 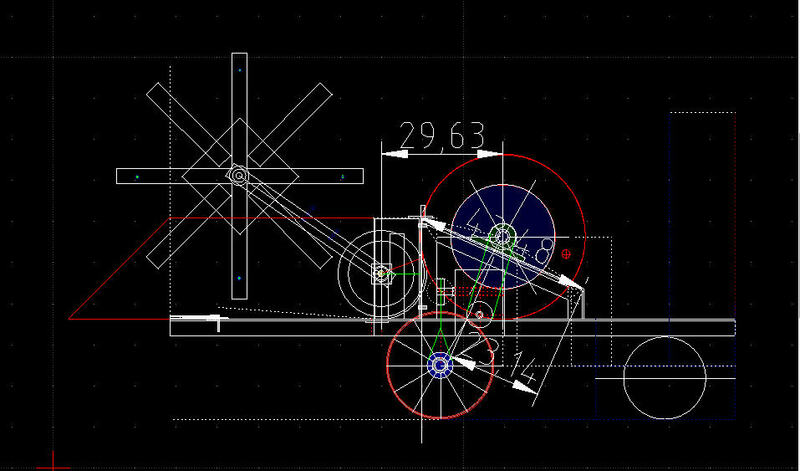 I am designing simple machine for agriculture. As you see, there are many circles in it. As you see in my second picture, there are many things there. 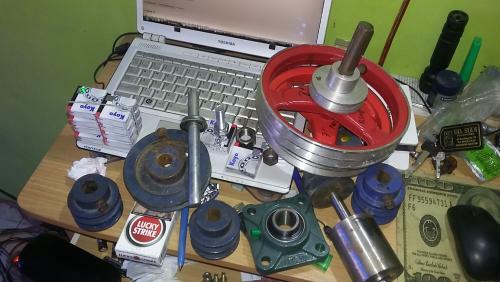 They are pulleys with different types and size, nuts with different size, axles with different size too, bearing with different type and size, and many more, include my Lucky Strike circle . What I know from a circle is its diameter or radius and the thickness for real 3D part drawing. As you may imagine, when we try to draw even one pulley, will be many circle we draw. In this case, include it bore size. To apply these parts/components to a real drawing (in the case of 2D drawing), we point where the circle (the parts in this case) we will be put. Normally, I don't know what the coordinates I will put. And in most cases, I put it at the end of a line as it is normally in real machine. Or even I have to draw a helping line, either it just a single line or a cross line, to help me to put the circle center. I never ask what is the coordinate of that point (even I understand that sometimes that way also required). And I believe it is the way to draw. To do that purpose, I work with (Center, Point). But as you mentioned there is another (Center, Radius), I have tried it. Unfortunately, in my LC 2.2.0 RC1, I don't know what to do with it. When I chosed that tool (Center, Radius) from the tool menu, it asks "specify circle center". When I click one point in the grid, than it drew a very small circle and no more I can do with it. It is finished. It was not asking the radius. Is it possible that my LC is error? Must be considered which one is more common or more frequently used. Is that point a center and enter the radius or point a center and enter a point as radius? I do confuse with the logic here. But if the (Center, Radius) is the way to make it work as I experience with LC 2.1.3, probably the (Center, Radius) need to put it in the first option. From your explanation, I now use relative coordinate. I used @(radius)<0 for just complying requirement. But we should not bother our mind with angle as circle is 360 degree. I just realize that there is another way to do. But seem this will lead to wrong as the radius already pre-entered from the previous circle drawing. Any entity should be free from any default or embedded size and dimension. It should be drawn when we put the requirement. Otherwise, it will lead to mistake. This is dangerous. Thank you. That also will do with "Center, Point". Using "@(number)<angle" also will do. Let me tell that my intention to post this "complaint" is not because I don't like LibreCAD, but it is because I like it. I love it. This is my way to give feedback for development. Quite the opposite, we need and like contributions like yours to know what's possibly wrong with LibreCAD and what could be improved. But we also have to consider the broad user base with all the different kind of using cases. As I wrote before, especially this little change of text was discussed for a while. There were pros and cons and the current text "Specify point on circle" is the consent at least. I just realize that there is another way to do. But seem this will lead to wrong as the radius already pre-entered from the previous circle drawing. There may be other users with different applications who are happy about this "Circle, radius" tool as they may have to draw many circles with same diameter and then this tool is what they need. I understand that sometimes tools appear senseless or wrong, but often it turn out to be because of different strategy or personal preferences. But we can only check and discuss this when user like you report about their problems, keep it up! So there are mostly multiple ways for tasks in LibreCAD and it's up to the user to find his best work flow to reach his goal. Yes. That is one of the great things about LibreCAD: you can accomplish the same thing in many different ways. Here is a tip for you in case you didn't know it. As you know, you can enter a relative coordinate like this: "@2,0" but in version 2.2.0 you can also enter "2..0". LibreCAD will translate this to "@2,0". This, to me, is easier than having to hit SHIFT+2 to get the @ symbol. A very useful feature. About circles. LibreCAD offers eight (8) different ways to draw a circle. I use Center,Point and Center,Radius most of the time. On a rare occasion I will use one of the other methods. I suppose that i have used them often enough that I don't find an confusion with them at all. This is just a personal observation and my feedback to the development team is to not change these two methods.